Written By Tips on how to prepare your home for bathroom remodeling. Finally deciding to remodel your master bathroom is a huge step. 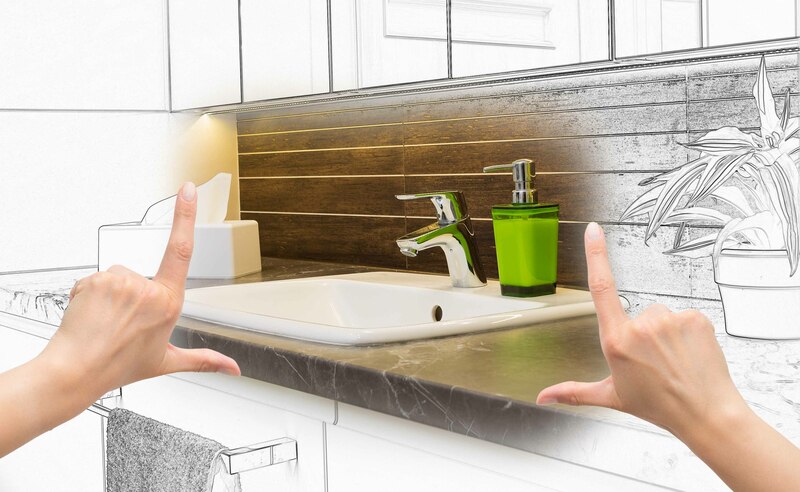 Bathroom remodeling in Northern Va has become a specialty for us as we have seen more and more homeowners going ahead and pulling out the old builder grade cabinets and countertops and opting for more functional and luxurious space. Through our many a bathroom remodels, we wanted to share with you ways that you can prep for your bathroom remodeling project. Let’s just get it out there now because you will need to be prepared for dust (and lots of it). Construction sites have their fair share of messes, from dried grout to wood shavings, there is no lack of mess that can accumulate during your bathroom remodel. A rule of thumb we always say is to clean up as you go. Cleaning as your remodeling project is underway will keep you sane in the long run and keep from spreading sticky construction dust into your HVAC and duct system. We always wish that every project goes without an unexpected hiccup, but it is still safe to prepare for the unsuspected delay. Between materials being on backorder and plumbing issues, there is bound to be a setback. Just make sure to plan for a minor problem to arise, but with the help of your contractor- it shouldn’t be out of their scope to handle in a decent time frame. Setup a makeshift bathroom for your family to use during the remodel. A functional bathroom to get to is probably the thing we stress the most with our clients. You will need access to your hair dryer and your products, so make sure to create a “bathroom-away-from-your-bathroom” to keep you sane during your remodel. It doesn’t have to be anything fancy, but the more space you can give yourself the better. Duct cleaning may have a bad rap, but getting your HVAC duct system cleaned after your remodel might be a good idea. A lot of times dust can end up in the duct system and create dust in other parts of the house. Allergies can also be affected because of how fine construction dust is. Hiring a reputable duct cleaner can make sure that dust doesn’t reach you’re A/C system and cause harmful damage you have to pay for later. Just make sure to check out the companies online and see past reviews. It’s going to get noisy. With any remodeling project, the sound of hammers and demolition can get a bit annoying. Plan to be out of the house as much as you can during your project to keep your sanity. Let your contractor know of any noise restrictions your HOA might enforce before the remodel begins. It is always nice to take it a step further and let your neighbors know that they might hear a few bangs and saws during the project as well. A bathroom remodeling project is exciting, and with the proper planning, can be well worth the construction dust and occasional hammer! Look for more extraordinary ideas for bathroom remodeling inspired by new design Projects.